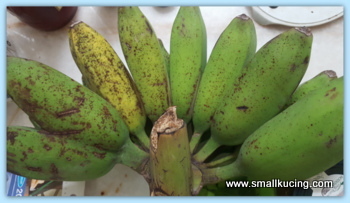 Some time ago a gardening friend gave Mamarazzi a bunch of banana. This is called Pisang Abu. 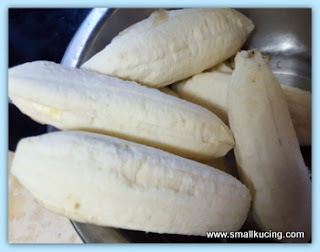 According to friends, Pisang Abu is good for making Banana Fritters but then Mamarazzi always fail in this . It always end up not crispy or burnt. Then her friend gave her an idea. Why not make it into "kerepek". 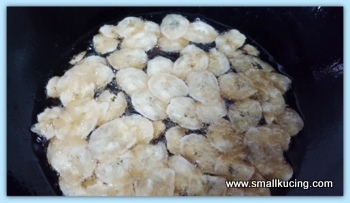 According to him, it's the same way as making arrowhead chips. Tested. Hmm.... it works. Just slice the banana right over the hot wok. 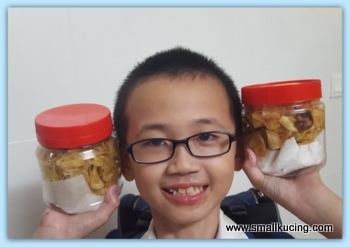 Came home from school, I have two tubs of banana chips to eat. For taste, one can add icing sugar or some salt. What about the "head and tails"? Waste not. Put into the oven and baked with cheese. Papa got to eat that. Good idea to finish up the bananas. Dont ask me the name of each bananas. They all look the same to me. Except colours and sizes. Haha. Cheh cheh loves this. Me, no, thank you. I love kerepek piasang. Can eat many packets! Quite an invention Kathy. Of course, how to resist the crispy crunchy chips. Once you start munching, there will no end. The dish with cheese looks so good! I have not heard of the other banana dish, I bet it is very good! We have pisang Abu, and pisang Awak. I like to eat the later. These have little different look then our here in Pakistan. Heard first time about chip made by bananas. Yes they tasted great . Honestly I only heard about this Pisang Abu some 2 years ago from the Malay fruit stall. I happened to ask the fruit seller why their pisang gorengs were so different and better from the ones we made at home >>>>> PISANG ABU! 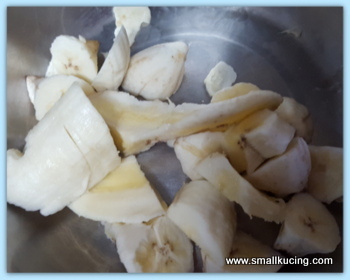 I wonder how you slice the banana with slicer as they are so soft =.="
hahaha....still okay la... cos easy to take out the skin. I will skip the sugary version, but will love the salted version. Can you send me some by mail??? Did my comment come trough? You always make your cooking sound so easy peasy! I tink I will like the banana cheese more....hahaha! eat with ice cream lagi shiok! Bananas with cheese, not my kind of taste. But bananachips with some salt are delicious. Just experimenting. 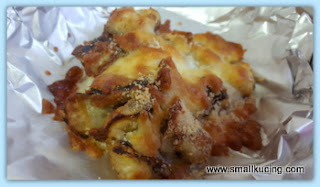 Over here we have fried bansna with cheese.